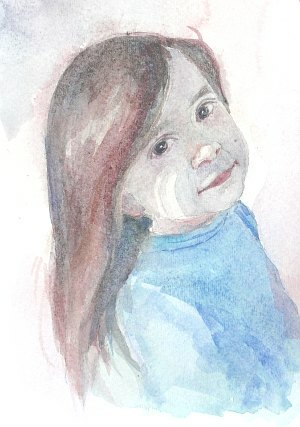 In this step by step watercolor demonstration, I am going to show you how to paint a watercolor portrait of a little girl. I had a photo reference for this demo, but I did not stick to my usual rule of accuracy in drawing. 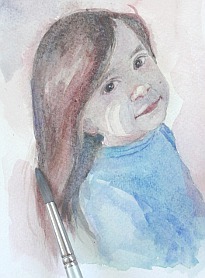 I mainly want to show you how a portrait is done somewhat 'tightly' in watercolors. 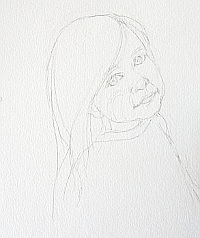 First I have sketched the subject with a light 2B pencil. With tightly rendered painting, a carefully drawn subject will spare me from much agony later on. One thing I did not show here is the pencil drawing with values all mapped out beforehand. I begin with washes of various color all over the paper. I use a big flat brush for this job. The hair is done with some cool red color underneath for glazing later as I intend it to be darker. I mingle the colors instead of blending the colors. The area of the highlights in the hair is kept. 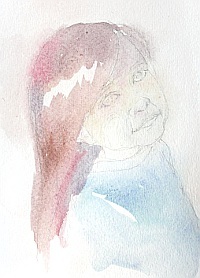 The face is washed with neutral colors mingled directly on the paper with the lighted area kept intact. 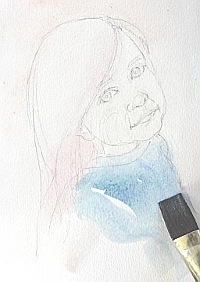 Continuing to lay more transparent washes over the hair around the highlight, I keep the hair wash and face wash separate (making sure the two washed do not blend into each other). I mainly use a round brush for this purpose. 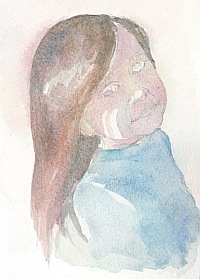 While the face wash is still damp, I model the value in the shadow of the face with darker mingled colors. These mingled colors are blended on the paper. There are really two to three subtle tones in the girl's shadowy face. The blue of the clothes are gradually glazed. As you can see, another layer of wash further darkens the shadowy portions of the face, making the lighter parts of the face show up better. I wait for the washes in the face shadows to completely dry. Then I paint the eyes and eyebrows with a small round brush. I make sure to soften the lines of the eyes and eyebrows. Remember that there are no sharp lines in nature. When the hair wash is almost dry, I model it further with a round brush to define the strands of hair and darken the shadow areas. I define her mouth with a round brush when the wash around that area is completely dry. I will look for some damp areas for adding more wet paint to create more tones. With watercolors, you need to keep looking for opportunities to add washes. Success is a matter of the right timing. 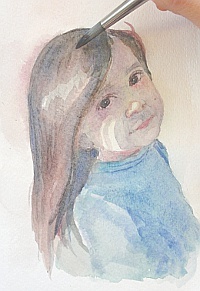 I make the area behind the hair and her right ear darker. I also add darker accents on her hair. I work around her by adding washes all over. 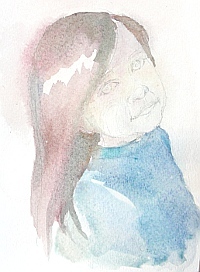 I wet a brush with clear water and press it against the unwanted red 'bleach' to wash it off, which, at the same time softens the edge on the back of her hair. All done. I could push it further, but I am afraid I might overwork the piece and ruin it. 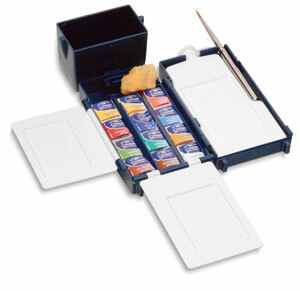 Even though the paints I used are a good brand, they turned out to be more of student grade. As a result, I feel that I have already reached the limit of what I can do with them for this little step by step watercolor demonstration. The colors are not intense (or lightfast) so it takes layers of paint to cover the underlying layers. Normally I would use professional artist paints for serious art work; you get what you pay for. Nevertheless, I am glad that the painting turned out well—especially the face. 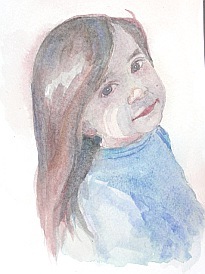 For a good watercolor portrait, it's best if you obtain a good reference photo with a single lighting source that produces a definite contrast between light and shadow. Make sure your drawing is correct. It's really important to have a fairly good idea of the tonal relationships between the colors before you dab into them. And remember: practice, practice and practice.